With no other reason to go to Vienna, I would travel there simply to be able to eat its Semmeln and Schnecken. The Semmeln are bread rolls widely used for every meal. With butter and jam (or butter and cheese or butter and ham), they make a tasty breakfast. Also, they perfectly accompany soups and main courses served for lunch and supper. Fresh, light, and flaky, they are the best bread I can imagine. 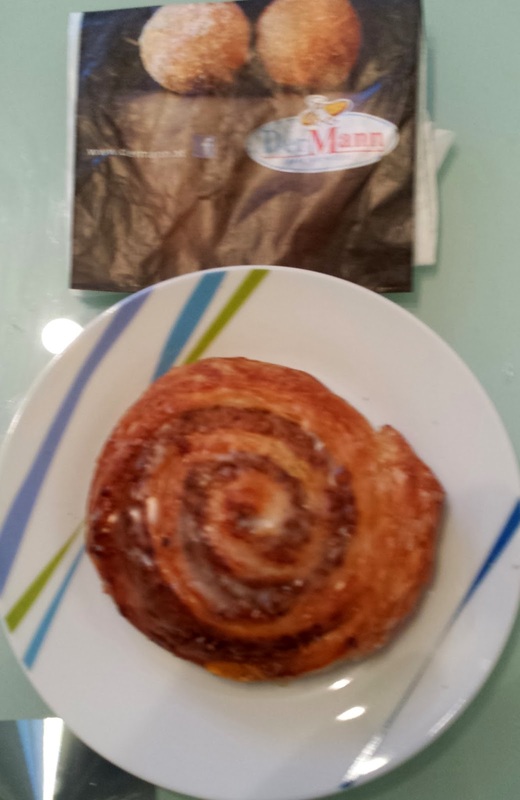 While I like Semmelm, I love Schnecken – the pastry, not the slimy mollusks. 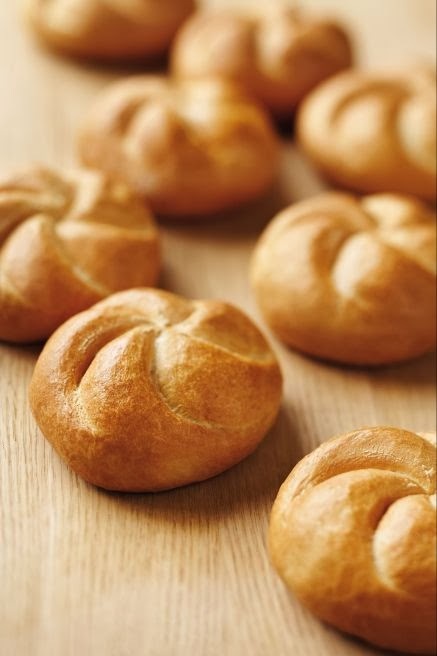 The German word “Schnecken” means snails, but it is also the name given to a pastry in the shape of a spiraled circle, which, I suppose, vaguely resembles the shell of a snail. This shape is often seen in cinnamon rolls sold in Panera and other bakeries and coffee shops in North America. However, make no mistake about it: American cinnamon rolls are to Schnecken as a slice of white bread is to a Semmel. The differences are huge. 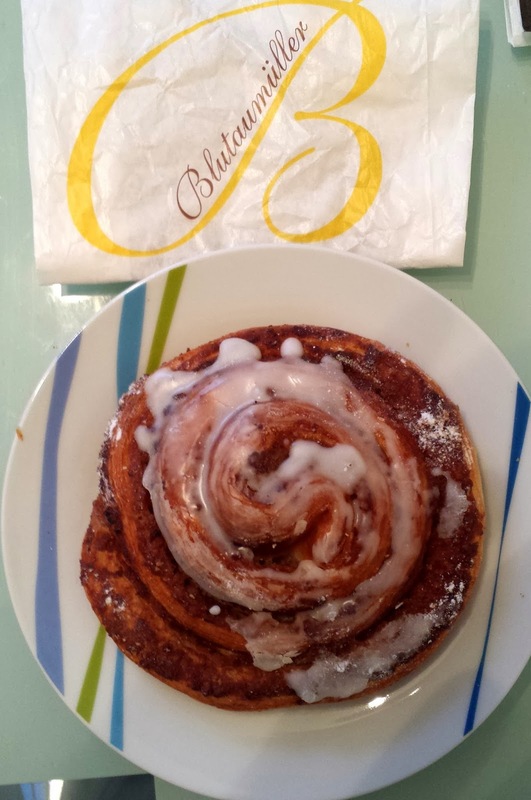 Compared to a Schnecken, most American cinnamon rolls are heavy, doughy, very sweet and super cinnamon-y. They assault the taste buds with sugar and weigh heavily on the stomach. 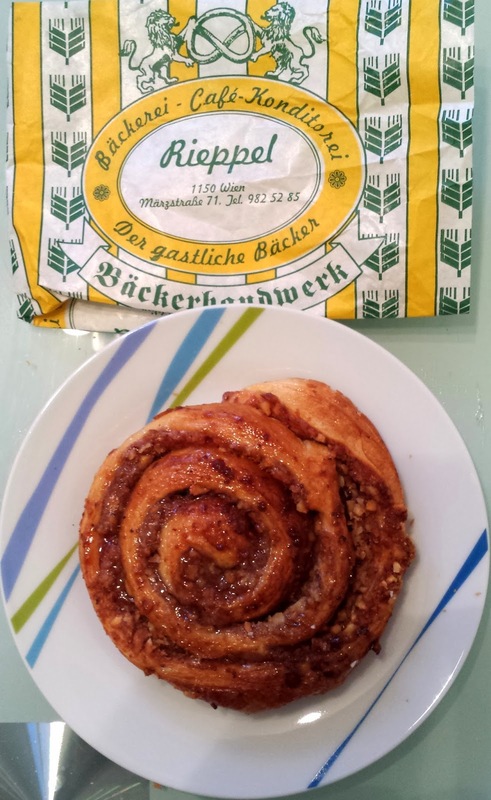 In contrast, Schnecken are much lighter, flakier, less sweet, and have a more subtle taste. 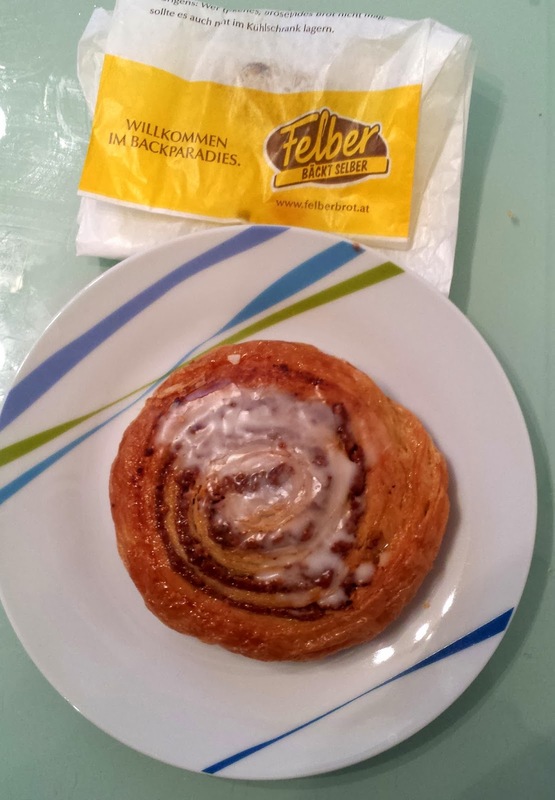 Don’t get me wrong: I love sugar as much as most Americans and have enjoyed my share of American cinnamon rolls; however, I still prefer the Viennese version. 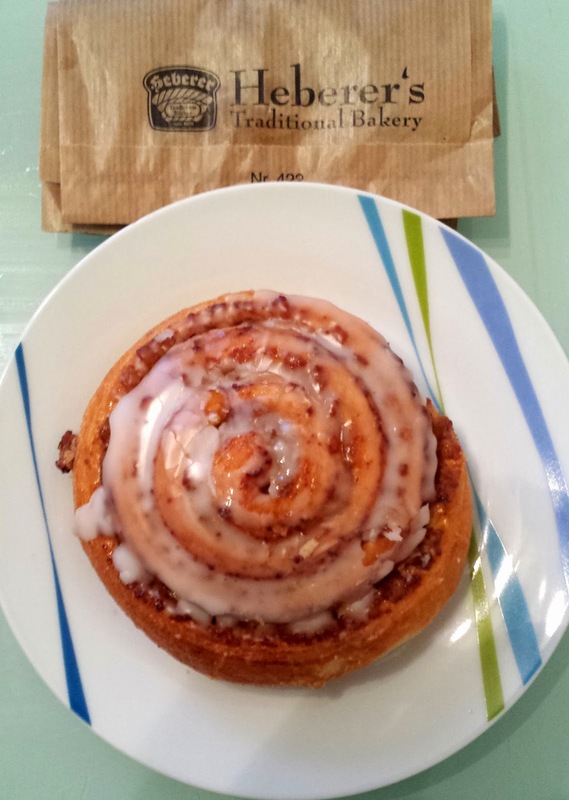 While most freshly made Semmeln taste pretty much the same wherever you buy them, Schnecken differ from bakery to bakery. 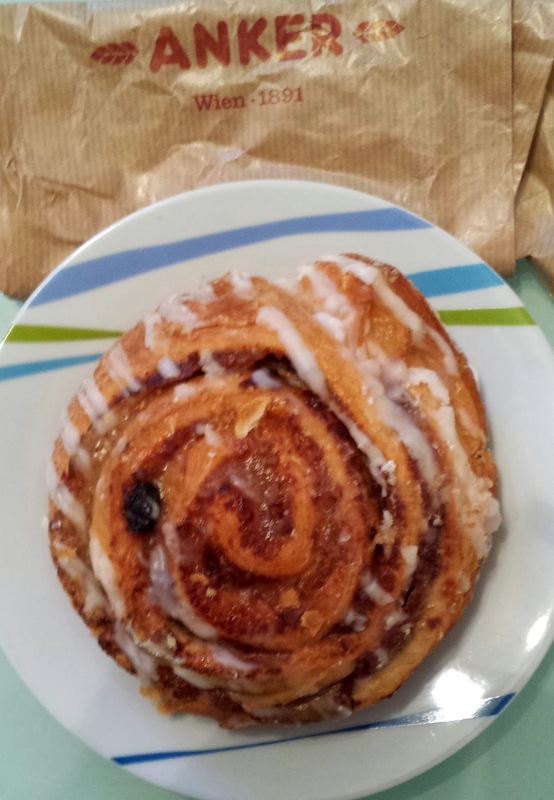 As with Semmeln, Schnecken should be eaten only when fresh (avoid packaged Schnecken). Fortunately, Vienna has a bakery with fresh Semmeln and Schnecken within a short walk of almost every Viennese, so both can be purchased daily. Since eating my first Schnecken in 1967, bought at a Konditorei on Schottengasse, I have not been discriminating in where I purchase Schnecken. Typically, when in Vienna, I buy a daily Schnecke from the bakery nearest to where I am staying, or I pick one up at a shop in the subway (U-bahn) station that I use most often. 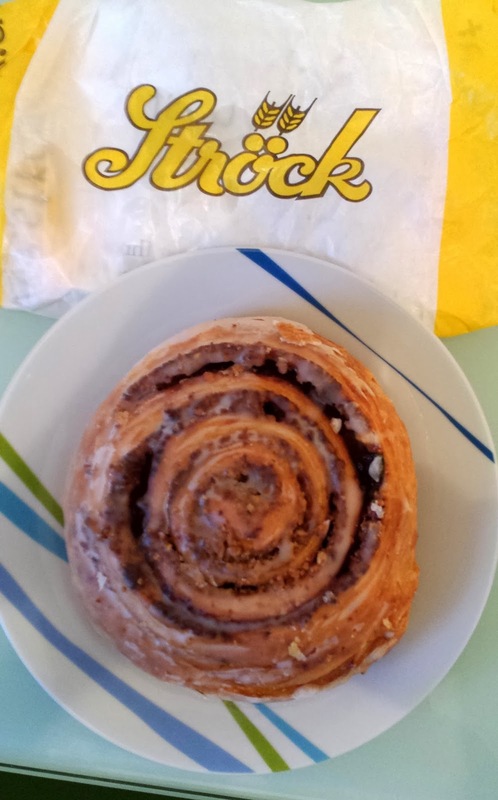 After decades of indiscriminate buying, I decided in December to determine which bakery makes the Schnecke that I like most – in other words, to find the bakery making the best Schnecken. So, over a period of about ten days, I bought and tested Schencken brought at seven different bakeries. Before discussing the bakeries and their Schnecken, I should mention that Schencken are no longer a uniform product. They now come in different flavors, including chocolate and vanilla. Of those, the cinnamon Schnecke (Zimtschencke) is most like the traditional Schnecken that used to be sold in every bakery. Anker. This bread company, founded in 1891, has over 100 outlets in Vienna. It is a very visible chain, with convenient locations on major streets, subway stations, and other places with substantial foot traffic. Ströck. 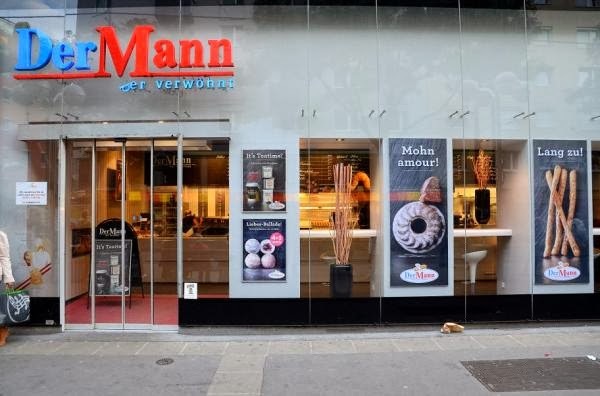 This bakery chain has about 75 branches in and near Vienna. 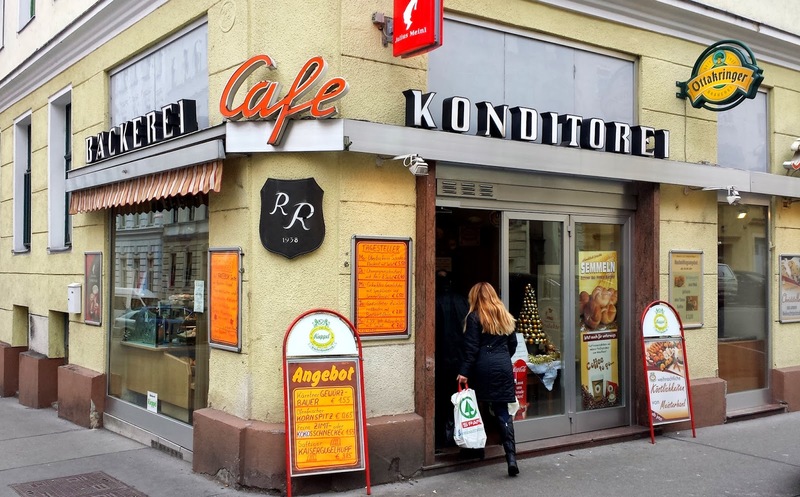 It is a family-owned bakery whose first shop was opened in Vienna in 1969. The Felber bread company has about 45 stores in and near Vienna. It was founded in 1957 in Vienna’s 16th district and is managed by members of the Felber family. Its strange slogan is “Felber bäckt selber,” which literally means “Felber bakes itself.” I think the real meaning is that Felber bakes everything it sells. 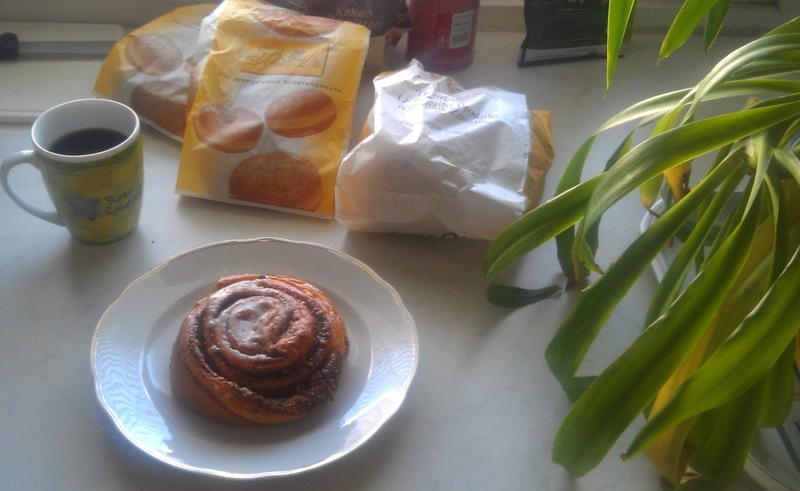 Aside from the four large companies, I tested Schnecken from a German-based company that has over 300 stores in Germany, but only one in Vienna. That store, Heberer, opened a couple of years ago in the new shopping center built when the West Train Station was refurbished. 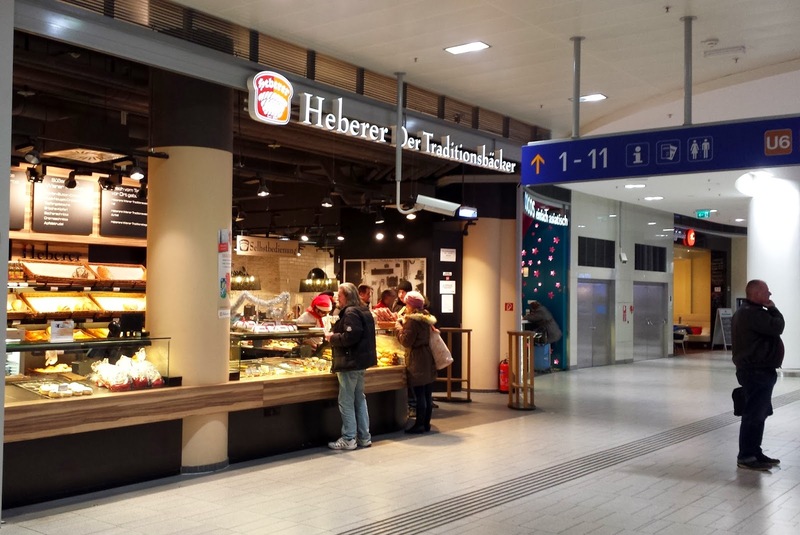 Heberer, which features “Vienna style” baking, traces its history to 1891, when Georg Heberer opened a store in Offenbach, Germany. In 1928, his son Georg became a master baker at Kaffeehaus Demel in Vienna before returning to Offenbach. The slogan of the store is “Beim Heberer, da Schmeckt’s,” which means, roughly, Things taste good at Heberers. Blutaumüller Café Bäckerei. This family owned business first store opened in 1953. The final place from which I obtained a Schnecke was a neighborhood bakery, located a couple of blocks from the apartment I rented in December. This owner-operated bakery is not part of any chain. 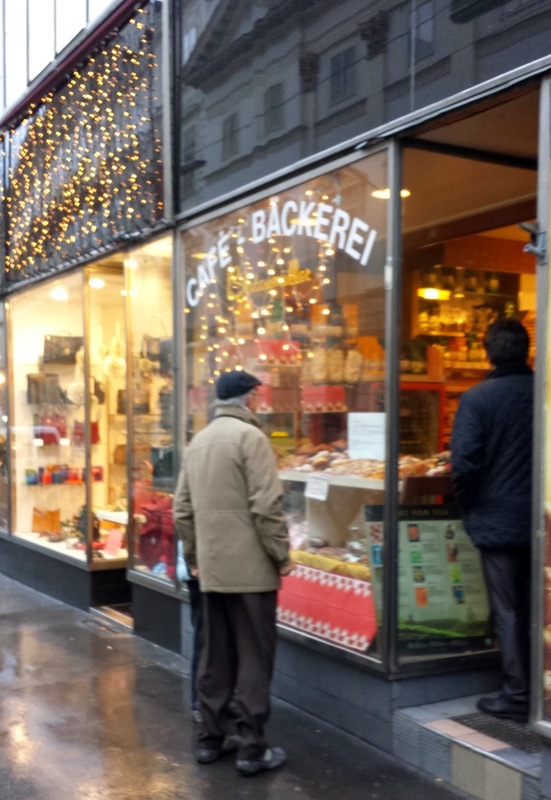 Of course, Vienna has many more bakeries than these seven (which together have over 300 stores in the city), including some bakeries with multiple stores and many owner-operated neighborhood bakeries. Thus, the competition for “best Schnecken” excludes, for now, the Schnecken at the bakeries I did not visit. 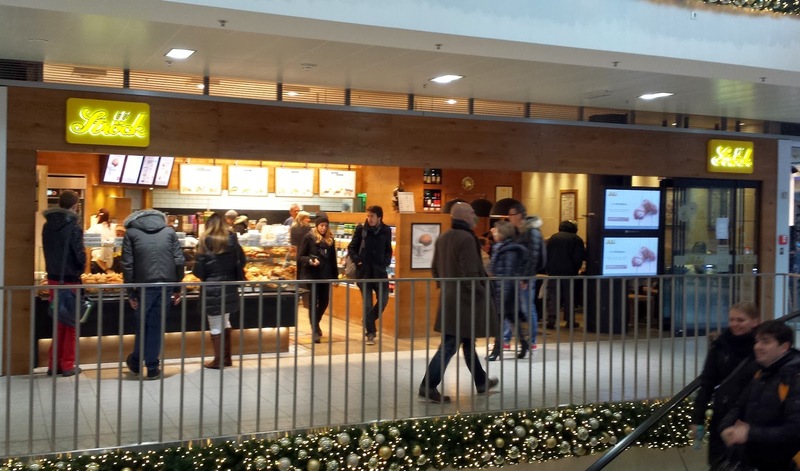 Nevertheless, I would estimate that the bakeries operated by the seven companies included in the sample sell at least 80 percent of the freshly made Schnecken sold in the city. In taste testing the Schnecken, I established six criteria to use for the comparison: (1) Optimum sweetness (plenty sweet, but not too sweet), (2) Nuts (the amount and the tastiness of the nuts), (3) size (the bigger the circle the better the score), (4) crispiness (how light and flaky it is), (5) the vividness of the cinnamon (it should be evident but not overwhelm other tastes), and (6) overall taste/appeal. I awarded up to five points for how well each Schnecke scored on each criterion. #7 Rieppel. Average score: 4.0. I ranked this Schnecke highest is its use of nuts, but it was not sweet enough for me, and it had no glaze. It was medium sized. #6 Ströck. Average score: 4.1. This Schnecke ranked at about 4.0 on all of the criteria, but lacked a feature that pushed it ahead of the other others. Quite good, but not transcendent. #4 Blutaumüller. Average score: 4.6. This Schnecke has a simple, but appealing, taste. The sweetness level was high, with a nice cinnamon overtone. However, it was lacking in nuts. I liked its size: it was larger and thicker than most of the others. #3 Der Mann. Average score: 4.7. Sweet and laden with cinnamon, this Schnecken tastes great. However, its use of nuts is not very impressive. It was an average size. #2 Heberer. Average score: 4.75. Perfect sweetness, plus crunchy nuts. This Schnecken could use a tiny bit more cinnamon. This schnecken has good heft and a memorably complex taste. Its size is about average. #1 Anker. Average score: 4.8. This is one huge Schnecken! A two hander. It has a nice balance of sweetness and cinnamon taste. It integrates the nuts nicely into the overall package. This Schnecke is so good, I want one now! There you have it. In my opinion, Anker, the bakery with the most stores in Vienna, makes the best Schnecken (at least, Zimtschnecken) in the city, followed closely by Heberer, a bakery with only one store in the city; Der Mann, another large bakery; and Blutaumueller, a smaller bakery. The other bakeries also sell fine, tasty Schnecken. In truth, you cannot go wrong buying a Schnecke in any of Vienna’s bakeries. I look forward to revisiting these store and trying others the next time I make to Wien.